How big is the average Briton’s carbon footprint, really? After a year in which climate policy has gone backwards in the UK, Dr Stuart Parkinson, SGR, analyses the latest data on our contribution to climate change, and finds some disturbing results. The current government’s rolling back of many policies aimed at reducing carbon emissions has been documented and criticised by many, including myself. One of the ways in which the government has defended itself has been by pointing out that UK emissions have fallen considerably since 1990, and therefore that Britain still remains a leader in climate action. 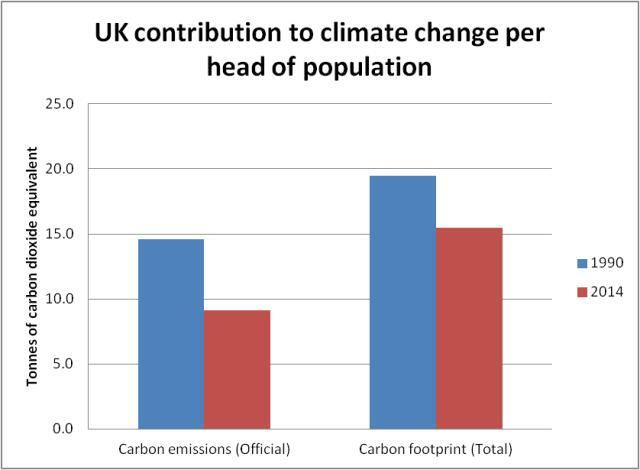 But a closer look at the UK’s carbon footprint, and especially the carbon footprint per head of population, casts considerable doubt on that view. But a recent, largely-overlooked report by the Committee on Climate Change (CCC) – the UK government’s advisory body on this issue – helps to put things in a different perspective. This report provides an overview of research comparing ‘production’ emissions and ‘consumption’ emissions. Production emissions are those emitted within a nation’s borders, and are the official way in which emissions are measured (such as those figures above). Consumption emissions are allocated on the basis of who is responsible for those emissions. So, for example, if a laptop is made in China but bought and used in the UK, under a consumption-based accounting system, the UK would be responsible for the emissions of manufacture and use, but under a production-based system, only use would be counted as part of the UK total. Arguably, it is the consumption-based system – more commonly known as the ‘carbon footprint’ – which is most appropriate to use, but it is not because it is significantly more complicated to compile the data. Importantly, the CCC report pointed out that the UK has markedly increased its net import of energy intensive goods since the early 1990s. It estimated that in 1993 the UK’s emissions would be 35% higher if all the goods used in the UK were manufactured here. By 2010 that figure had jumped to 80%. So, if we use the consumption-based accounting method for the UK,  then the average contribution to climate change per head of population increases to 19.5t in 1990 and 15.5t in 2014. The increase in climate impact is shown in the graph below. Not only is the level per head much higher, the percentage reduction between 1990 and 2014 is only about half the official figure. Given that other major economies – such as the USA, Japan, Germany and France – all have significantly lower levels of imported carbon emissions per head,  this puts the UK up among the higher emitting nations of the world. How did this situation arise? There’s a clue in the current problems in the UK’s steel industry. A closer look at the UK’s carbon statistics shows that, although the UK has made some important steps forward in replacing coal in the electricity sector with lower carbon sources, and in the housing sector through improved efficiency, the gains in the industrial sector have, at least partly, come from shutting down factories and importing goods from abroad instead. This makes our official carbon statistics looks good but does little to help the planet! So there is absolutely no justification for the UK government cutting back on climate action. Quite the reverse – we need to accelerate the transition. Much more ambitious policies on energy conservation, energy generation from renewable sources and sustainable consumption urgently need to be pursued. Dr Stuart Parkinson is Executive Director of SGR. He holds a PhD in climate science, and has written widely on the subject. Converting all emissions into ‘carbon dioxide equivalent’ is the standardised way of measuring the global warming effect of different greenhouse gases, including carbon dioxide, methane, nitrous oxide and other such gases. This figure includes an ‘uplift factor’ of two due to emissions from aviation occurring in the stratosphere, thus doubling their climate impact. p.21 of: CCC (2013) – note 7. This assumes that the proportion of imports was similar between 1990 and 1993, and between 2010 and 2014. Note that this is a conservative assumption. p.22 of: CCC (2013) – note 7. Indeed, since under the Paris Agreement nations have agreed to keep global temperature change “well below 2C” the cuts needed are even higher.